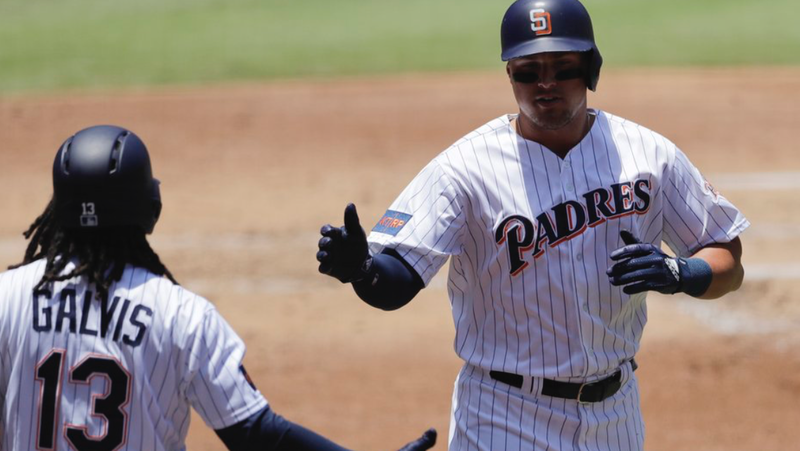 The San Diego Padres have been playing some very solid baseball and rebounded nicely after a 14-1 drubbing at the hands of the Atlanta Braves. On a bullpen day, Andy Green utilized his chess pieces perfectly as Matt Strahm and four other relievers combined to give up one run on four hits. The start of the game began just like the last one; with a Freddie Freeman RBI. Instead of a double, however, Freeman would pull the very first pitch he saw into right field for a solo home run. Strahm would not be shaken by this, and got Nick Markakis to fly out to end the inning. San Diego would get to Atlanta starter Mike Foltynewicz in the second inning of play. After Hunter Renfroe led the inning off with a single to left field, Cory Spangenberg would yank an elevated cutter into the gap in right-center field, allowing Renfroe to wheel around the bases and score as Spangenberg would stop at third for a stand-up RBI triple. After Raffy Lopez drew a walk, Manny Margot laced a ball that glanced off the glove a leaping Ozzie Albies and trickled into right field for a RBI single to give the Padres the lead. With the bases loaded though, Eric Hosmer would strike out to end the inning. After a runner advanced to second base, Strahm would get pulled for rookie Jose Castillo. The rookie would immediately get help from his defense as Freddy Galvis made a smooth snag on an Albies lineout for the second out, and Dansby Swanson would get cut down for the final out. Castillo would get through the fourth inning unfazed despite hitting Tyler Flowers and allowing a single to Charlie Culberson, and the ball would be handed off to the submarine pitcher Adam Cimber. This was bad news for the Braves, as Cimber would cut through Peter Bourjos, Foltynewicz and Albies like a knife through hot butter to strike out the side. Next up on the list is Kirby Yates, and the right-hander continued to assert the dominance that the San Diego bullpen had displayed all game long, tossing two innings while flashing the strong splitter that has turned him into a premier set up man. Closer Brad Hand would be called on for a six out save in the eight inning, and while he gave up a leadoff double to Albies, the crafty closer would turn on the cheat codes to render Swanson, Freeman and Markakis helpless against his wipeout slider and Hand would escape the inning. 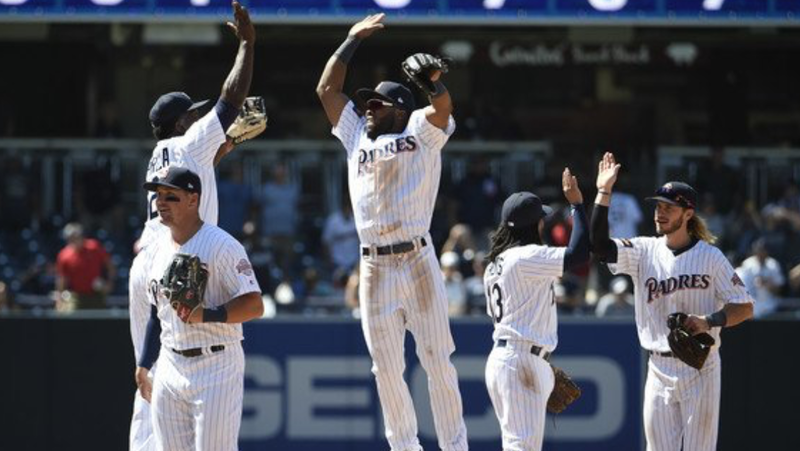 The Padres would employ small-ball tactics to scratch across a run in the bottom of the eight inning. Jose Pirela and Spangenberg would get on base with singles and Green would call for the squeeze play. Galvis would drop the bunt perfectly to score Pirela from third, and the Friar faithful could breathe a little easier knowing that the home team had a two-run lead now. Any comeback attempt made by the Braves would be stopped in their tracks as Hand boosted his trade value even more with a 1-2-3 ninth inning, and with the 3-1 victory in the bag, San Diego took the series from the Braves and finish with seven wins and three losses for the homestand. Some individual Padres have been heating up as of late. In this series, Cory Spangenberg went 4-10 (.400) with a home run, two triples and three RBI. Raffy Lopez went 3-for-7 (.429) with a home run and two RBI. Jose Pirela also went 4-for-12 (.333) with a double and a RBI. The Padres would like to see all three of these men continue their hot hitting. After this homestand, the Padres will have only have five games at home (with the final game of the Pittsburgh Pirates series coming on July 1) in the month of June while they travel to five different cities. The will be traveling to Miami, St. Loius and Atlanta before returning to San Diego for a two-game series against the Oakland A’s. They then travel upstate to San Francisco before hopping on a plane to Arlington to face the Texas Rangers.